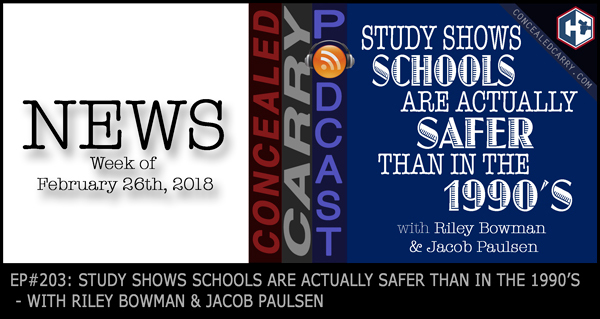 Today Riley and Jacob talk about the latest news from across the gun and concealed carry industry. The NRA is taking the blame for the Parkland, FL shooting. It looks like Delta Airlines may be paying a HUGE price for this idiotic move. Mass shootings and school shootings may not be as bad as the media would have you believe. Also we cover an amazing report from a professor at Northeastern University that explains with substantiated facts that schools are actually safer now than they were back in the 1990's. Listen in to find out how and don't miss today's JUSTIFIED stories that also support the pro-gun stance! Share this with all your friends and family! Did mass shootings increase 200 percent since assault weapons ban expired?